HOAL: Science Questions – How can Faecal Pollution be Monitored in Real Time? Science Questions – How can Faecal Pollution be Monitored in Real Time? Microbial water safety management can be enhanced by real time detection of faecal pollution from enzymatic activity. Such measurements will also shed light on microbial transport processes at the catchment scale. The HOAL is an ideal test bed for such automated measuring devices due to its highly dynamic runoff, sediment concentrations and bacterial contamination from manure. 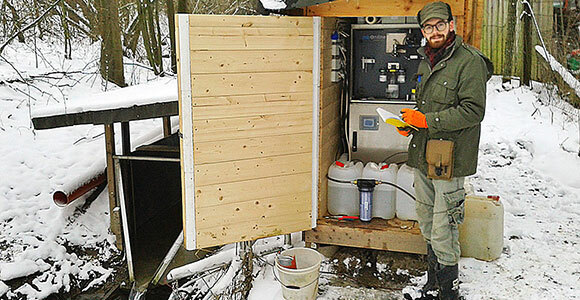 Four enzymatic analysers with two different designs have been set up at the catchment outlet. The devices sample stream water at intervals of 1 or 3 hours. The results for different setups are compared with laboratory analyses in order to optimise the strengths of the instruments in a real time mode. Interpretation of the faecal indicators in the context of physical and chemical parameters for events with contrasting characteristics (e.g. fast and short response times, dry and wet antecedent soil moisture) sheds light on microbial pollution processes. Manure events and the fate of faecal pollution can be identified from the time dynamics of the indicator.